GB IRVINE HQ double gold on her debut on juvenile 1! Started at compnet ! 1. 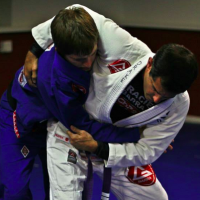 When did you start training Jiu-Jitsu? This April of 2018 will be 4 years. 2. Where did you start training ? Where do you train now? Who’s your instructor ? 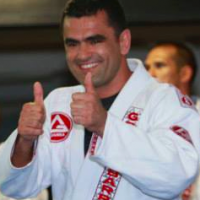 I’ve been training at Gracie Barra Irvine, CA since the beginning and I would like to stay Gracie Barra forever. I train under Professor Rod and Professor Philipe. 3. What took you to start competing? When I heard about the GB Compnet about 3 years ago I thought it would be a good first competition to see where I am at in my training. 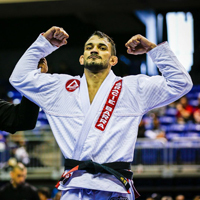 When I was done with the competition I loved jiu jitsu more than I already did before I competed. 4. Tell us a little bit about your training routine? I train Monday-Friday and on Saturdays and Sundays I help out with privates. I always coach before I train for at least 2 hours as well. 5. What’s your favorite position or submission ? My favorite submission would be triangles for sure. I love any choke submission. 6. How is your tournament preparation ? I found that when I think too much about a tournament I go into panic mode. So what I do now is relax and take my mind off of what’s to come. I try to have fun with it most of all now. And once I get to the tournament that’s when I get my headphones on and I start to focus. But even then I’ll say Hi to some friends I see around and just relax. 7. How long before pan ams did you start prepping ? I’m always preparing for the next competition no matter how far out it is. So for Pans, let’s just say I’ve been prepping since I started even though I didn’t know it. 8. Did you do anything different? Did you abdicate of anything with the championship in mind? What was your hardest sacrifice if any? The only thing I would say that I did differently was the strength training I started at school. Of course I would have to sacrifice my social life outside of jiu jitsu to train the hours I always do but I wouldn’t call it a sacrifice if I love what I do. 9. Tell us about your future plans! What’s your next dream? My future plans? Well, Worlds is coming up right! That’ll be the next gold I’ll reach for. My dream is a whole different story. My dream would be to be the black belt world champion. But that’s not for a while! 10. 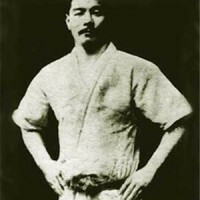 Who’s your idol in Jiu-Jitsu? There are many idols in my life for jiu jitsu. 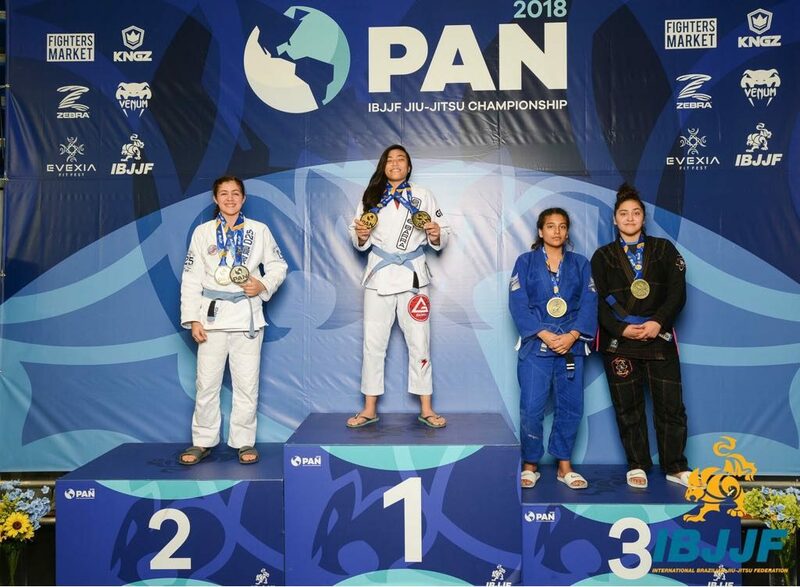 One being Professor Ana Laura because of how much she has accomplished in jiu jitsu and her students. And Professor Jessica Flowers because she is such a force to be reckoned with on the mats. But most of all I look up to my Professor, Rod Quevedo, as a teacher and a mentor. 11. What do you do to control your emotions the day before or the day of the tournament ? I don’t like holding back my emotions for what I feel about the upcoming tournament because knowing me I will explode. So I usually I talk it out with my mom, my dad, or Professor Rod and because of this they help me come to ease about the tournament. 12. Do you work with anything else rather than Jiu-Jitsu? Do you go to school? Full time Jiu-Jitsu? I go to Beckman High School and I am currently in 10th grade. Aside from jiu jitsu I do quite a few activities in Girl Scouts. But jiu jitsu has stole my heart the most. 13. Send a message to the next generation or who is just starting! You will have your good days. You will have your bad days. But if you can keep going through all of it, you will come out better and better each day. They aren’t kidding when they say jiu jitsu is for everyone. 14.Have you ever thought about quitting? How did you go about ? I have only thought about quitting once. Once in my whole life did I want to quit so bad because my week was not the best. But I told my self that champions don’t quit. So I took some time to breath and collect myself. The next day I was on the mat feeling better and ready to roll. 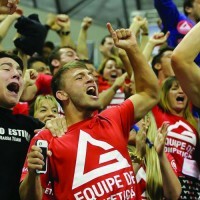 15.What does Gracie Barra or the Red shield represents and means to you ? 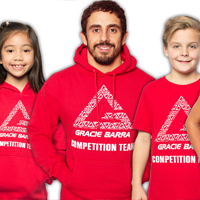 To me Gracie Barra means a team but most of all a Family. 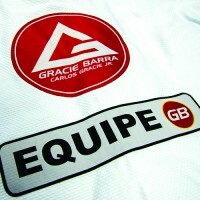 Gracie Barra has always been there for me and more so the people in it. The Red Shield, to me, means that I’m representing the school I love. It is like my weapon that I take to each tournament. I’ve learned from a young age to always stay humble. So I tell myself there is always someone out there better than me but if I keep going eventually I’ll be better than her. Alanah Juezan from GB IRVINE HQ double gold on her debut on juvenile 1! Started at compnet !